A think-tank led by a former Congressional Budget Office director has come up with a price of the New Green Deal. The American Action Forum concludes Alexandria Ocasio-Cortez's Green New Deal Could Cost $93 Trillion. Until you do it, I'm the boss. William Nordhaus was a co-recipient of the 2018 Nobel Prize in economics for his work climate change. He compares AOC's Green New Deal with the cost of doing nothing and various alternatives. Please consider William Nordhaus versus the United Nations on Climate Change Economics. Nordhaus is arguably the inventor of the modern economics of climate change, with contributions going back at least to his 1979 book. The first row of the table shows what the DICE model—as of its 2007 calibration—estimated would happen if the governments of the world took no major action to arrest greenhouse gas emissions. There would be significant future environmental damages, which would have a present-discounted value of $22.55 trillion. In contrast, the second row shows what would happen if the governments implemented an optimal carbon tax. Because emissions would drop, future environmental damages would fall as well; that’s why the PDV of such damage would be only $17.31 trillion. However, even though the gross benefits of the optimal carbon tax would be some $5 trillion as a result (because of the reduction in environmental harms), these gross benefits would have to be offset by the drag on conventional economic growth, or what is called “abatement costs.” Those come in at a hefty $2.20 trillion (in PDV terms), so that the net benefits of even the optimal carbon tax would be “only” $3.07 trillion. Consider, now, the scenario “Limit temp. to 1.5°C.” Recall that this is the IPCC’s current policy goal and that various environmental analysts and pundits also embrace it. Because Nordhaus just won the Nobel Prize for his work on climate change, one might suppose that his model would provide support for the UN’s goal. It doesn’t. Assuming one believes climate change is worth dealing with, then it's important to not only factor in the the benefit of halting climate change, but the cost of doing that as well. That is precisely what Nordhaus does. The numbers are from 2007. They may be way out of date, or not. However, AOC's Green New Deal adds in countless other items besides climate change that all contribute to the massive cost of her deal. 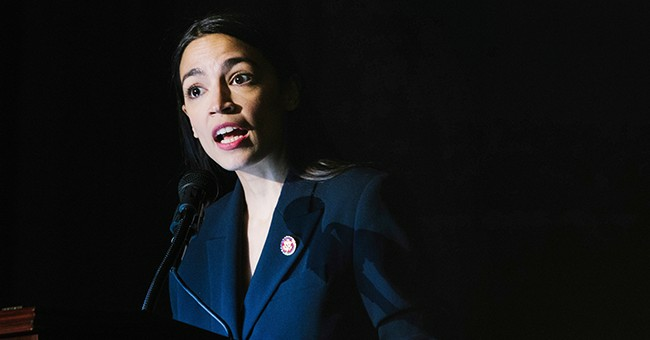 It is reasonable to assume the benefit of AOC's proposal vs doing nothing is negative to the tune of at least $20 to $80 trillion depending on the actual price one places on her proposal. Let's return one more time to Dilbert Creator Scott Adams on Climate: "Hockey Stick is a Symbol of Lying"
Adams came up with three red flags to consider. I added three more. Adams then proposed a methodology in which to decide if the climate deniers were wrong. Let's assume climate change is real, and the skeptics are wrong. I am willing to change my mind, as is Adams. I concluded: "The notion that politicians will do anything sensible about the problem seems ridiculous." AOC, Al Gore, and the UN study provide massive supporting evidence to my position.